The mask rehydrates, mattifies, anti-acne. It is perfect for oily, combination, or acne-prone skin. That's what this mask brings! 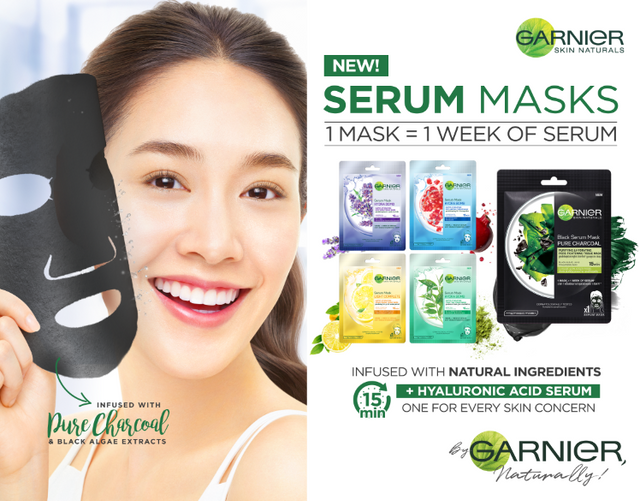 Made with Green Tea extract (Camellia Sinensis leaf extract) and Hyaluronic Acid Serum (Sodium Hyaluronate), @garnier 's Serum Mask Hydra Bomb is like a tall glass of iced tea to the skin in this scorching hot summer season. It has a sturdy cotton sheet mask with a stiffer cotton sheet backing in bluish green. The fit is not perfect but adjustable. I had problems with the nose and mouth holes being a bit higher than my nose and mouth areas but it didn't bother me totally. There were more than enough essence in it. So I soaked my face in it and used it like a serum before putting the mask on. Ah heaven. Loved the soothing green tea scent too. garnier serum mask is very good in my face. it intensely rehydrated my skin and makes it soft after use. it is also minimize the pores of my face and my pimple heals! I was hesitant because i don't usually put a lot of products on my face because it gets itchy and develops rashes quickly as a reaction to new products. But this mask was surprisingly gentle and very hydrating on my face. After using it, my skin felt very soft and smooth. I would consider making this a weekly routine. Since I've been travelling a lot, my skin has always been a problem for me because it always feels dry for being exposed to the sun. HYDRA BOMB ULTRA HYDRATING REBALANCING TISSUE MASK is personally my favorite face mask because it gives me an instant glow. This mask has a cooling effect as well. It really brought my skin back to life. It gave extra moisture after 'we used it. I could not ask for a better sheet mask. It does not irritate my skin compared to the other face mask I've used before.